Ciara has a PhD in English from Maynooth University. 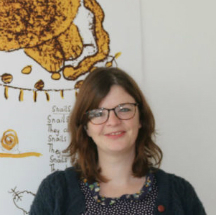 She has worked as researcher on the National Collection of Children’s Books (TCD) and “Gender Identity: Child Readers and Library Collections” at the Centre for Children’s Literature and Culture, DCU. She has taught English in various universities and currently works at Kids’ Own Publishing Partnership as office administrator. The Creativity and Change course continually pushes its participants, encouraging us to engage, act, and reflect in new and different ways. One of the most fundamental ways it stretches its participants is simply through giving students the opportunities to start something new – to begin new actions, challenges and experiences, and in the process, to unearth new confidence for future beginnings. At each of the course weekends, we participate in intensive workshops on different creative forms. For example, one weekend focused on poetry and theatre. We moved from creating poetry as a collective to individual creative writing and finally into spoken word performances and a poetry slam. The following day, performance and action were channelled into theatre as we engaged with some of the techniques of Augusto Boal’s Theatre of the Oppressed. Throughout the course of the weekend we moved through reflection and action; from our own words to shared action and performance through poetry, and from the action and movement of the Theatre of the Oppressed to reflection again. Not only did we experience this as participants, we considered this process as facilitators – thinking through ways we could engage people through these creative forms in a manner that encourages interaction with beginning to write and enact change. Our next task on this weekend was putting this cycle of reflection and action to use in a new context as we moved from the safe space of the Creativity and Change workshops to the public space of the city. Part of our challenge for the afternoon was to engage the public in some way, encouraging people to contribute to creating something as a group. My group set about getting people to contribute to a line poem, written in chalk on the street, beginning with the line “I know I am home when…” I was surprised at how readily and generously people got involved, moved by their openness and warmth. Individuals and small groups contributed their lines, writing on the pavement, marking the city space out as theirs a little bit more. Groups of people contributing collectively take away some of the pressure and open up new possibilities. The same was true for our groups, as our styles of interaction with the public crossed and intersected, and we reflected on and learned from each other’s actions. Even though our engagement with the public was small and transient, we learned it is possible to bring people together to create something worthwhile, that people care and will get involved. The willingness and want to be part of a collective is encouraging in these times when we need it most. Now to find all our different ways of starting.